The Photonics Spotlight - Mode Competition - Increased or Decreased by Spatial Hole Burning? 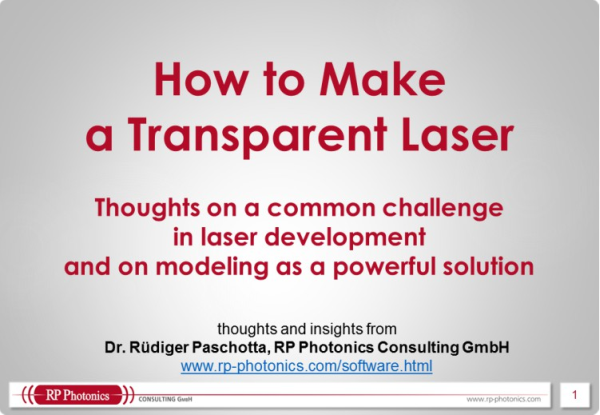 Abstract: In the scientific literature, there is some conflict of statements concerning mode competition in lasers. The article explains that this results from a different understanding of the term competition. Some research papers claim that spatial hole burning induces a competition of resonator modes in a laser resonator. But others say on the contrary that competition is reduced by spatial hole burning. I definitely favor the latter statement, and explain it in the following to lift the confusion which arises from this apparent conflict of views. They key is to define the term “competition”. In the context of resonator modes in a laser, I would describe that as the fact that different modes share (at least partially) the same region of a pumped gain medium, and in this situation there are cross-saturation effects: each mode can saturate the gain not only for itself, but also for the other (competing) modes. This kind of competition is reduced e.g. by spatial hole burning: different modes have not completely overlapping standing-wave patterns, so that cross-saturation effects are reduced. However, some people perceive competition as something causing unrest, and thus recognize it in lasers which are subject e.g. to spatial hole burning, exhibiting a steadily fluctuating pattern of power distribution on several (or many) resonator modes. They would then not recognize competition e.g. in a unidirectional ring laser, which exhibits stable single-frequency operation. But this stability exactly results from strongest competition in the former sense (the meaning which I prefer): the mode with highest gain is able to keep all other modes down.